Here at First Time Mom we welcome, support, and cherish ALL moms, but today I’m writing especially to our Christian readership. I’m excited to share with you a resource that will, Lord-willing, help you connect with God in the midst of your busy #momlife, Indwelt Bible Studies. How can I live by faith if I am not seeking the One in whom my faith and hope are found? I can only pour out good things to those around me if I am being poured into by my Creator and Savior, Jesus Christ. Still, spending time connecting with the Lord can be a challenge, especially in this season of mothering little ones. Don’t get me wrong, I LOVE studying my Bible! My mom, a twenty year veteran Precepts Bible Study teacher, instilled in me a love of God’s Word. Give me my ESV study Bible, a prayer journal, some colored pencils, a Strong’s Geek / Hewbrew Lexicon, and an hour of uninterrupted time and I am a happy camper! Sadly, that kind of in-depth, inductive Bible study rarely happens around here, which is why I’m so happy to have found Indwelt Bible Study Guides. To facilitate this review I was given the Strength + Dignity An Indwelt Bible Study Guide. It is a verse by verse study through Proverbs 31:10-31, which is arguably one of the most foundational passages for understanding Biblical womanhood. 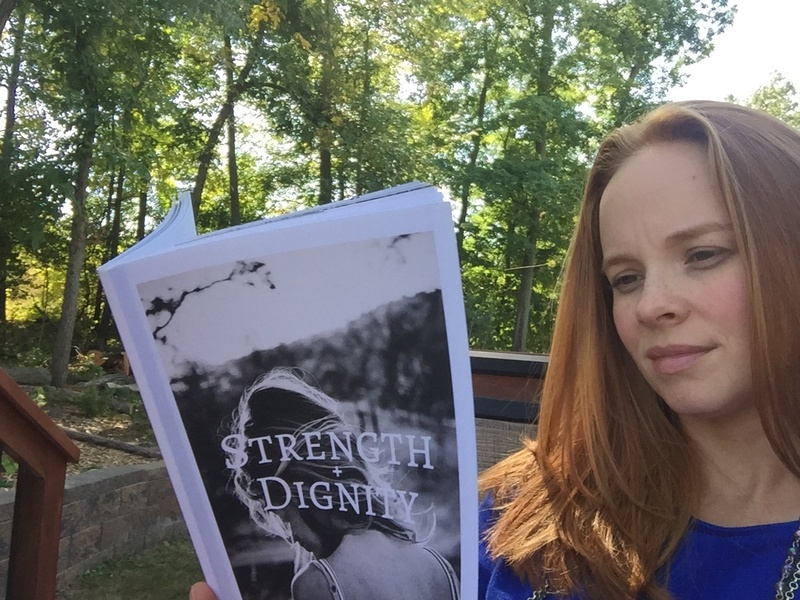 In an age when we’re bombarded with images and messages of what our society values in women it is truly living-giving to discover that God’s values godly women who are clothed with strength and dignity. Indwelt Bible studies have everything you need, the Scripture and work book all in one place, which I find super convenient. They are small enough to fit into your purse and I love the simple, yet artist look of the studies. 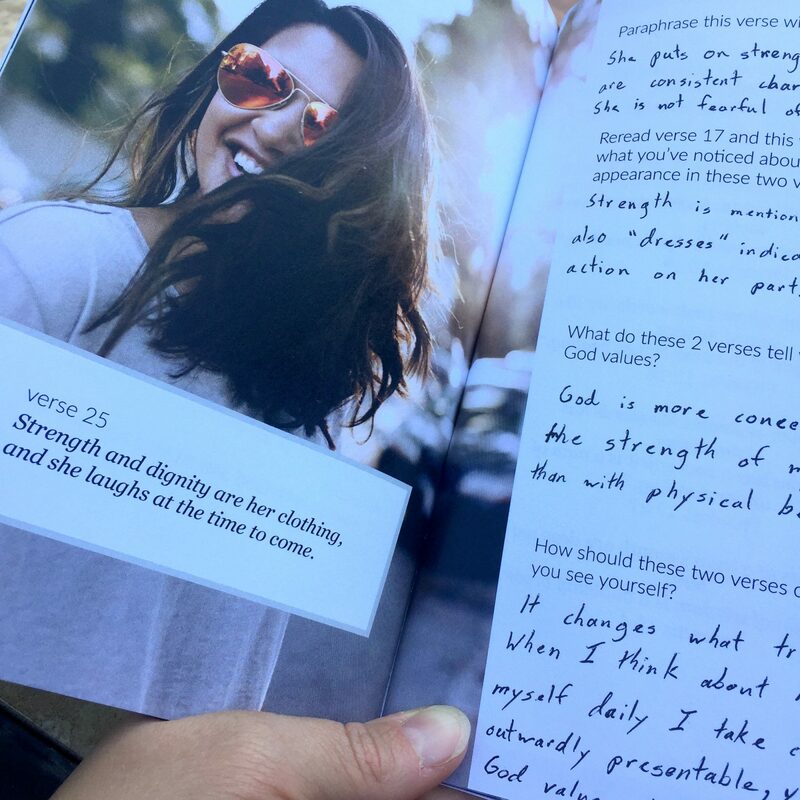 Rather than telling you what she thinks of a passage Maggie writes Indwelt Bible Studies to help women discover God’s truth through prayer and their own personal study. These Bible studies do not spoon feed you truth or give you someone’s opinion about what the Bible says, rather it gets you into the Word so the Holy Spirit can do the teaching. Now I would be remissed if I didn’t mention that #IndweltWomen is much more than another Bible study publisher. Maggie hopes to see it become a movement, “Uniting wives + mamas in His Grace + Truth one verse at a time.” You can get more great resources by following Indwelt Women on social media: Facebook, Instagram, Pinterest, etc. You can also connect with other Christian women in the Indwelt Facebook group and get encouraged weekly listening to the Indwelt podcast. Whether you try an Indwelt Bible study or connect with #IndweltWomen on social media, I pray that this post encourages you to carve out a few moments in your busy day to seek the Lord and be encouraged by His Truth. Being a mom is one of the hardest and best things we could ever do. Praise the Lord that as 2 Corinthians 12:9-11 tells us, God’s grace is sufficient for us and His power is made perfect in our weakness. By His strength we can do this #momlife thing and we do not have to do it alone. May the Lord bless you as you seek Him!